As Bill Gurley (General Partner at Benchmark Capital and board member of Uber) notes, Uber will be the dominant player in the ride-hailing business. Why? Because Uber’s business model is predicated on localized marketplaces of supply and demand for drivers. These localized marketplaces create strong network effects and “winner-take-most” markets. The localized network effects are built on local liquidity of supply and demand for drivers and riders. This can be best summed up by this image that Gurley features in his post. With this model driving Uber’s meteoric rise, tech pundits from Benedict Evans to Ben Thompson are asking the natural next question: What does the self-driving car mean for Uber? As Jeff Bezos of Amazon says, “Your margin is my opportunity.” Moreover, as Benedict Evans of A16Z notes, autonomous vehicles will be designed differently, with fewer features, thus making them even cheaper than cars that human drivers are using today to transport riders. With economies of scale, it therefore seems plausible that autonomous vehicles will be 60 percent cheaper than human-driven vehicles, even if Uber maintains its gross profit per ride. 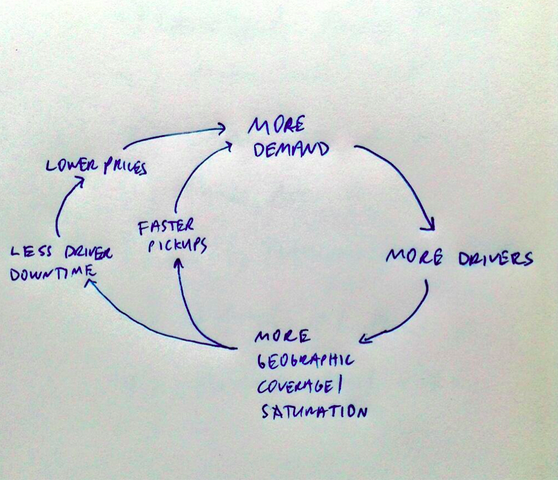 Let’s return to Uber’s virtuous cycle. As outlined by Gurley, if we substitute “more drivers” with “more autonomous vehicles” and “lower prices” with “way lower prices,” it appears that the “market” breaks. You could argue that an aggressive company could accomplish the same task now by simply paying drivers a flat hourly fee, even if there’s no demand — but it doesn’t make any sense to do that because drivers are intrinsically temporary. Paying drivers now doesn’t mean drivers will service riders later. On the other hand, paying for a car now, even if it’s underutilized, doesn’t mean it won’t be utilized in the future. Moreover, the marginal cost of a car sitting in park two miles from downtown approaches $0. If it’s indeed possible to ever break Uber’s lock on the market, the shift to autonomous vehicles will be the disruptive force that enables someone else to win by beating Uber on asymmetric terms. Being first to market with the right vehicle will be paramount. Even a one-year head start could dramatically change the market dynamics now that Uber and its rivals have educated the market. Being first to market with the right vehicle will be paramount. Google is best suited to productize autonomous cars for ride-hailing. Google invested in Uber and thus has access to useful, confidential information about the ride-hailing business; Google has the best mapping solutions in the world, the most advanced automated driving solutions and the first vehicles designed from the ground up to be autonomous. It’s hard to imagine any company that’s better poised to capitalize on this opportunity to break Uber’s impending monopoly. However, as Benedict Evans notes, self-driving technology will commoditize. Given that Google is financing most of the R&D and their history with Android, it’s probable that Google wants to commoditize autonomous vehicles. At some point, it will not make sense for a single corporation to finance tens or hundreds of billions of dollars of assets. Rather, banks or public markets should finance these assets. It will be interesting to see. P.S. Google named “Google Drive” a little bit too soon.